In the Armenian language, horak'uyr means father's sister, which is what we called my Aunt Varsenig. She was a wonderful baker and cook, whose kitchen was immaculate and well stocked at all times. I was fortunate to be able to spend some time with her learning how to make some great Armenian favorites. 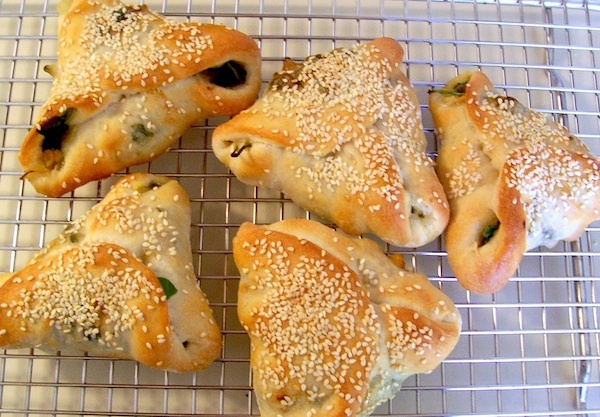 While this spinach bread recipe has changed over the years, it still bears a great resemblance to my aunt's version. I am grateful to her and to many other women who spent hours in the kitchen preparing food and sharing their talents with those who would carry on the torch to the next generation. Enjoy! 1. Prepare sponge: In a large mixing bowl, stir yeast and sugar into flour, add water and mix well. Cover and let rise at room temperature until the mixture looks bubbly and is at least double in volume, 30 -60 minutes. 2. Make the dough: Add the remaining ingredients and mix as much as possible with a spoon. Bring the dough together with one hand, adding more water if necessary, as shown in class. 3. Empty dough onto a floured surface and knead for 8-10 minutes, using as little flour as necessary to prevent the dough from sticking. The kneading may be done using a heavy duty stand mixer on speed two for 5-6 minutes or speed one, for 10 minutes. 4. Round the dough and place back in the bowl. Cover and let rise until double (usually between 1-2 hours). 5. 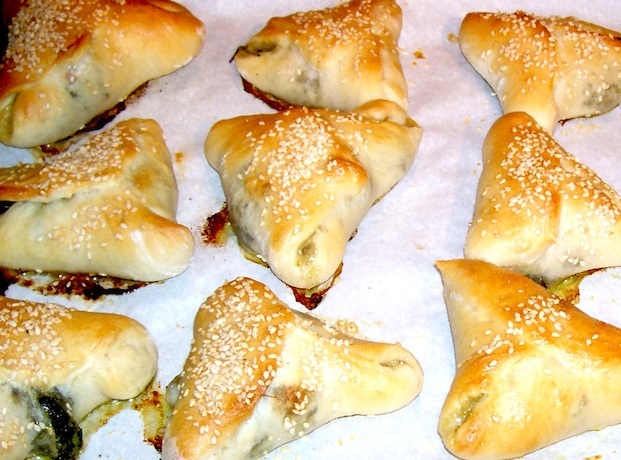 Divide the dough into 24 pieces and round each piece. Cover and let rest for about 15 minutes. 6. With a few pieces of dough at a time, stretch or roll each piece into a 5-6 inch circle. Place ~1/3 cup Spinach Filling (below) on each and fold over 3 edges, forming a triangular shape. For my cheddar version, add a little sliced or grated cheddar to the top before folding edges over. Cover and let rest for 15-30 minutes. 7. Brush with beaten egg or egg white, sprinkle with sesame seeds and bake at 400ºF for 25-30 minutes. Enjoy! 8. 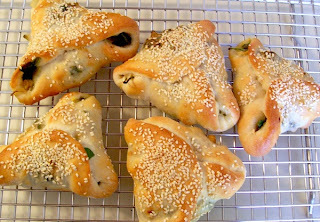 Spinach breads freeze well – just put them in freezer bags after cooled. 1. Place spinach in a large heat proof bowl. 2. In a large fry pan, sauté onions in olive oil until lightly browned. Add lemon juice and vinegar to the hot onions and turn off the heat. Add immediately to the spinach in the bowl and toss to wilt the spinach. Allow to cool before use. May be made ahead and refrigerated, but best if used at room temp. 1. In warmer weather, use cooler water. 2. I usually use Kosher or sea salt.